LAN Airlines is the national air carrier of Chile and a leading airline is several Latin American countries including Chile, Peru, and Argentina. LAN Airlines is headquartered in Santiago, Chile and is a member of the Oneworld airline alliance. The company was founded in 1929 and recently acquired Brazil's TAP Airlines to become the largest carrier in South America. Despite some complaints about inadequate on-ground service, LAN Airlines generally enjoys upbeat reviews especially for its generous in-flight meals and drinks. 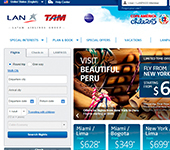 The LAN Airlines website is available in English and is mainly oriented around a deals feature offering special discount flights between Latin America and destinations in the United States and Europe. In the “Plan & Book” section, however, users will also find tools for online check in and to view one's flight status. In the same section, flyers will also find information on LAN's generous baggage allowance policy (two free pieces of checked baggage for international economy flyers). On the website, users can also find information on LAN's Lanpass frequent flyer program. The membership-based program lets used accumulate kilometers by flying LAN and redeem those kilometers for flights with LAN or its Oneworld partners like American Airlines, British Airways, Cathay Pacific, or Japan Airlines. Where is LAN Airlines located?